A disease such as the plague would take a heavy toll on any society that lacked modern medicines, hygienic living conditions and well-stocked hospitals. For instance, during the 1990s, there was an outbreak of pneumonic plague in India, which led to widespread panic, attempts by the government to stop mass evacuations from slum areas and ultimately hundreds of deaths. Journalists entering the area sensibly took their own antibiotics with them. You can read a New York Times report about this outbreak here. Although modern antibiotics had not yet been developed when the plague struck Sydney in 1900, the administrators of the city had the advantage of knowing that a bacterium had caused the disease and that rats harboured the fleas that carried it. A bounty was placed on rats – sixpence per rat according to one Melbourne report. 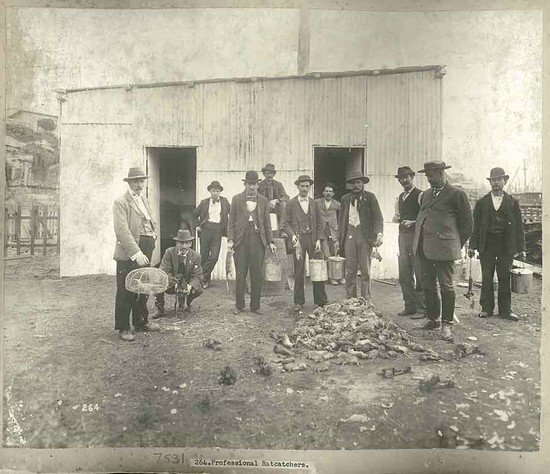 Poor and unemployed men became professional rat catchers (see the picture below). Since city administrators in the Middle Ages were ignorant of the existence of bacteria, such targeted measures were not taken then. Instead, the terror and panic of the suffering people often led to hysterical, superstitious and violent behaviour. Doctors and self-styled healers developed a range of bizarre, ineffective and even dangerous remedies. One group, the Brotherhood of the Flagellants, began to whip themselves as a way to pacify God and divert his wrath from them. Some accused the Jewish people of spreading the disease, which led to the persecution and murder of this already marginalised group. Below you will find several activities that will allow you to discover more about this horrifying disease and its effects, as well as people’s reactions and the long-term outcomes. Copyright: State of NSW. Kindly provided by the State Records Authority of NSW. That pile in the middle is made up of dead rats. 6 The Infographic Show: Could the Black Death Happen Again?